April 2011 – The Chapter house is being improved by redecorating the surrounding walls, reorganising the displays of archaeological finds and the explanatory notice boards, improving lighting and signage. Shortly the sand laid between the foundations will be removed and the levels reduced to give a greater impression of the layout of the building. – improved web site and on-line historical resources relating to the priory. 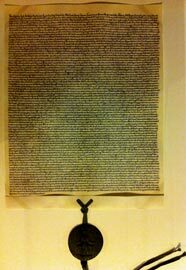 The Trust will also be displaying facsimiles of two remarkable historical documents, the Magna Carta(1215) and Statute of Merton (1235), which are being reproduced by hand by the calligraphers of the Royal College of Arms. Special thanks to the Dean and Chapter of Salisbury Cathedral, the House of Lords, the Museum of London, and City livery companies who have made these reproductions possible. 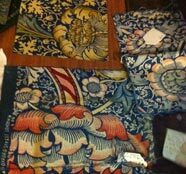 The Trust has also acquired original fabrics printed at Merton Abbey by Morris and Liberty, which will be conserved and displayed.